The outpouring of ideas from everyone has been incredibly helpful. I have been struggling with how I should get the router table to be flat, or at the very least to f sharp. So I sat at the piano and tickled the ivories. I didn’t progress much with her, but I still like to sit at my piano and goof around. It is a good place to think. I thought about trying to sand a perfectly flat surface, and one side of my brain tells me that it is possible, but unlikely, while the other side tells me that it is impossible and really unlikely. I considered trying to get my antique jack plane tuned up, but I don’t think I quite have the skill set for restoring the plane at this time, let alone, getting it in good enough shape to accomplish my task. The Makita 2012 NB table top planer seems like a good option, and Del at ACME has said they could order me one. But I am not quite ready to pull that trigger. So I play a bit and think a bit. Then I go downstairs and glue up another set of boards. With each set, I get closer to needing to make a decision. 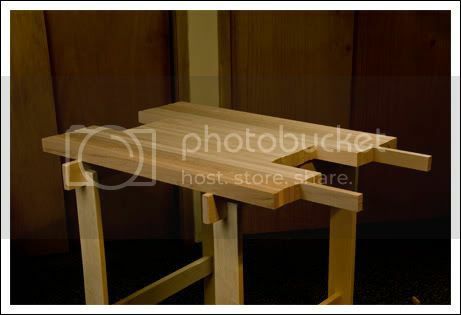 I also find that with each set I am getting better at my set up and execution of the glue up. I lay the boards out parallel to one another, apply glue to the first board, use my plastic spreading card to get an even coat of glue, and then stack the next board on to the one with the glue. I have also started to put little spacers into the cauls, to hold them open. This has made getting the boards into the cauls considerably easier. After trying a couple of different strategies for getting the wax paper in place, I now wrap a layer around the ends of the glued up set of boards, before I slide it into the caul. This is easier than trying to put the paper in afterwards. Once the boards are into the cauls, I tighten them a little bit, but not too snug. I clamp the ends next, which I made sure stuck out past the cauls by about 3 inches. Lastly I slide my Jet clamps under the boards, rotate them up, and tighten. I finish by tightening the cauls. I will not describe the methodology I used initially because it involved a lot more chaos and swearing. I glued up my boards in seven mini sections, and now am gluing the seven mini sections into three. The middle section is kept separate from the others, as it needs to be cut in half, thus creating the opening for the router plate. I have left an excess of about 1 ¾ inches on the middle section, and about 1 inch on the end sections. This will allow me to finish up the sizing by trimming off both ends. Since I knew that this step was part of my plans, I avoided stressing out about having the ends perfectly lined up. I got them as close as I could, and that was good enough. The joy of this project grows with each step. Actually doing a glue up is sort of exciting. I am sure that future glue ups will require much greater attention to squeeze out, but that is ok. I will cross that sticky bridge when I get to it. Keep up the good work! You are making excellent progress! I’m looking forward to seeing how this story unfolds. Here are a couple of things you might find helpfull. I lined the contact sides of my cauls with clear packing tape and I don’t have any sticking. I disassemble my cauls and place my boards on the bottom two so I can practice the glue up then I slather the glue, rub the two pieces together, slather, repeat. Then I put the top half of the cauls on, tighten slightly, clamp hard, tighten harder, clamp harder, repeat until my thumbs hurt. I also noticed you have your clamps pretty close to the glue surface of the boards. I read in a FWW article that the presure from a clamp can be found only under a cone 45 degrees to the left and right of the center of the pressure. 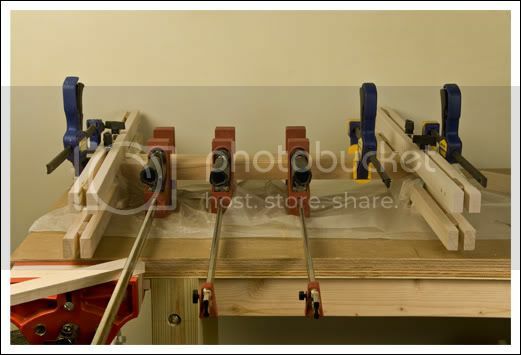 That means you need more clamps if there is not enough distance from the glue surface. If you place a couple of boards without glue between the glued boards and the clamps, moving the clamps back from the glue surface, you get better coverage from your clamps and a more even result. I love the bit about 45 degrees. I will remember that. Thanks. Nice improvements. We can all see your skills are getting good. Isn’t woodworking a lot like music? chromatic scales skipped in major thirds ascending and minor thirds descending for 30 min…same therapeutic result as gluing up a set of boards. Hi Brian, this blog keeps getting better and better. Nice read. Have you considered taking your glue up to a cabinet shop when complete and have them run your top through a big sander? I have found people in cabinet shops are usually pretty friendly and helpful as long as you are not competing with them. Just a thought and for the record, I couldn’t carry a tune in a bucket. I think this tabletop project is a great way for you to hone your skills Brian. I am not questioning your sanity here, but I am curious about why you chose a laminated solid wood table top in the first place. Most go with ply or mdf, or counter top stuff which are already flat to begin with. Are you doing it because it is hard to do, or does your plan call for that? Maybe it has something to do with anchoring the piano hinge securely? 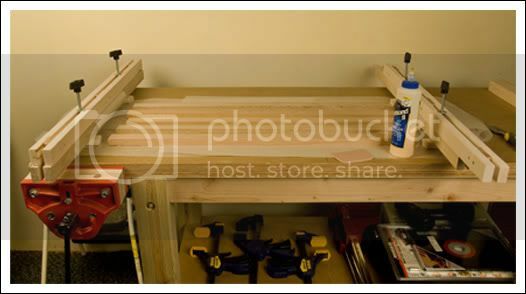 I actually had intended to use ODF, which is what I used for my workbench top. I choose to go this route, because it would give me a better learning experience. So I guess you are right, it is because it is harder to do than the other. I want to try to increase my skill set with each project.